Joey Dunlop, born in Ballymoney in 1952, was affectionately known to motorcycle racing fans and competitors alike as, ‘King of the Roads’ and ‘Yer Maun.’ Through his courage and ambition he became one of the most successful riders of all time. His incredible sporting career included five Formula One World Championships; 13 wins at the North West 200; 24 wins at the Ulster Grand Prix and a world record of 26 wins at the Isle of Man Tourist Trophy. His sporting achievements were recognised by Her Majesty the Queen when he was awarded an MBE in 1986. Ten years later he was presented with an OBE for his remarkable humanitarian work with children in Eastern Europe. Tragically Joey lost his life whilst racing in Estonia on 2nd July 2000. It is estimated that 60,000 people from across the world came to Ballymoney to attend his funeral. In May 2001 Ballymoney Borough Council officially opened the Joey Dunlop Memorial Garden. People from across the world arrive in Ballymoney every day to spend a quiet moment at the Joey Dunlop Memorial Garden and then have some welcome refreshments at nearby Joey’s Bar. The town has become a focal point for processions of bikers on their way to road races and also for Joey’s thousands of loyal fans who remember his many legendary triumphs. Robert Dunlop (November 25, 1960 – May 15, 2008) was the younger brother of fellow road racer, the late Joey Dunlop, and like Joey he died after a crash while racing. After an apprenticeship on short circuits, the teenage Dunlop made his road race debut at the 1979 Temple 100. A winner on the Isle of Man course at his first attempt he finished on a TT podium 14 times. 1986 and Robert Dunlop beats Gene McDonnell in a close finish to claim his first NW 200 win in the 350cc race. 1990 and Robert Dunlop storms to a hat trick of wins comprising two Superbike Race victories on the legendary JPS Norton and the 125cc race win.1991 Robert Dunlop scores a second consecutive hat trick with 125cc, 250cc and 750cc wins he went on to claim another hat trick of wins in 1993 & 1994. 2008 legend Robert Dunlop loses his life after crashing at Mather’s Cross at the NW200 practice. Less than two days later his son Michael won the 250cc race. Roberts Memorial garden is next to his brother Joey’s. It features a polished granite obelisk and a bronze sculpture of Robert. When your in Ballymoney, Visit Ballymoney Museum . The museum holds a unique collection of artefacts and memorabilia associated with Irish Motor Cycle Road Racing and in particular Robert & Joey Dunlop. 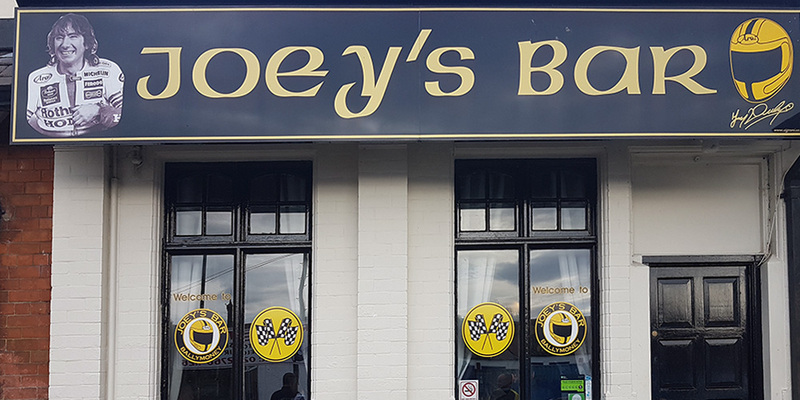 Call into Joey’s Bar, next door to Ballymoney Train Station and just down the street from the Joey & Robert Dunlop Memorials.